During the festive season we were lucky enough to spend some time with Barry Thornton during which he reviewed the Good Vibrations EA. We have made some great changes to this EA to the point that the changes changed the EA to a point where is no longer an upgrade but a complete relaunch of the EA. Close of candle decision making. We have added the facility for the EA to make decisions only when there is a closed candle. The other choice is to have decisions made when the entry criteria is first met. The closed candle gives more confirmation. It also makes the EA easier to optimize. Optimization using every tick basis took a very long time and the closed candle approach allows optimization in a fraction of the time. Basis for targets and stops. Previously the same leg averages were used to determine the stops and targets for the next trades. With Barry’s help this was changed to use the other legs average to determine stops and targets because those were the most likely distance the price would move. This was a change in trading logic and one of the reasons why a brand new version of the EA was created. Although the trading logic before was flawed this was compensated for when optimizing the settings. It does however mean that the settings for the previous EA cannot be used in the new version. During the first 70 day of running the Good Vibrations EA it became clear that the Good Vibrations EA was not suited to the 1 hour timeframe with all the 1 hour settings producing loses. 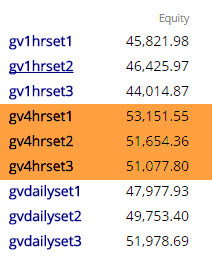 All the 4 hour settings produced gains and daily setting were inconsistent. Therefor we are focusing the Good Vibrations II EA on the 4 hour timeframe in future and specialising on that timeframe. We noticed in strong trends it would not be good to enter against the trend trades. We added setting at which levels buys will not be entered in a downtrend and sells would not be entered in an uptrend. Owner of the Good Vibrations EA? Owners of the previous Good Vibrations EA can decide to continue using it. They can download the new Good Vibrations II EA from the EAFactory website free of charge. Just log into your account and you see the Good Vibrations II Ea listed under your purchased products.